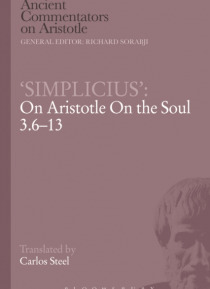 This is the fourth and last volume of the translation in this series of the commentary on Aristotle On the Soul, wrongly attributed to Simplicius. Its real author, most probably Priscian of Lydia, proves in this work to be an original philosopher who deserves to be studied, not only because of his detailed explanation of an often difficult Aristotelian text, but also because of his own psychologic… al doctrines. In chapter six the author discusses the objects of the intellect. In chapters seven to eight he sees Aristotle as moving towards practical intellect, thus preparing the way for discussing what initiates movement in chapters nine to 11. His interpretation offers a brilliant investigation of practical reasoning and of the interaction between desire and cognition from the level of perception to the intellect. In the commentator's view, Aristotle in the last chapters (12-13) investigates the different type of organic bodies corresponding to the different forms of life (vegetative and sensory, from the most basic, touch, to the most complex).